A traditional king cake is an iconic Mardi Gras treat in many homes throughout the world. The ‘cake’ is often the focal point of many office gatherings and family events for many reasons. Some love the king cake because of the dense flavor combination of the filling and buttery dough? Others use it as a centerpiece because of the beautiful array of purple, green, and gold topping. Many love getting a king cake because whoever finds the baby hidden inside will receive great fortune in the coming year. No matter what your favorite part of the king cake is, we are ready to make this the best year yet. The origin of the king cake can be traced to 12th century France. Epiphany Day (or King’s Day) is celebrated on January 6th each year and the period between Epiphany Day and Ash Wednesday is referred to as Carnival. Years ago, during Carnival, devout Roman Catholics would purge their homes of rich, fatty foods in preparation for the 40 days of fasting during Lent. The rich foods such as eggs, milk, lard, and meats were used to make a bevy of foods and desserts. Residents would binge on the heavy foods until the end of Carnival which took place on Fat Tuesday. Early Europeans developed a new creation during this period that used the rich ingredients as well as honored the meaning of Epiphany Day. The king cake was created to celebrate the coming of the Three Wise Men to baby Jesus. The cakes were circular to represent the route taken by the kings to confuse King Herod. The royal colors topping the king cake signify different elements. Purple represents justice; Green represents faith; and Gold represents power. Creamy puddings were made with leftover eggs and milk and used as fillings in the king cake. Our king cake is made with a rich, brioche-like dough. The twisted braid of each cake represents a king’s crown. The king cake is approximately 12 inches in diameter and serves 10 to 12 people. We insert a plastic baby in each cake that is hidden beneath the icing. This year, our cakes will have the traditional green, purple, and yellow sugar topping. While our base flavor is cinnamon, you can order a king cake with your choice of filling. We offer a variety of fillings including: Strawberry, Strawberry/Cheese, Lemon, Lemon/Cheese, Cherry, Pineapple, Pineapple/Cheese, Blueberry, and Raspberry. What’s the Deal with the Baby? In early days, trinkets representing royalty or the Christ Child were baked into the king cake to offer a token of good fortune for the finder. The practice became so popular; it still remains today. The only difference in today’s king cake over those of yesteryear is the material of the trinket. Most bakeries now insert a plastic baby into the cooled cake prior to icing. We strive to create a variety of flavors on a daily basis on the days leading up to Mardi Gras. However, if you want to guarantee your king cake flavor is available, we strongly suggest ordering ahead. 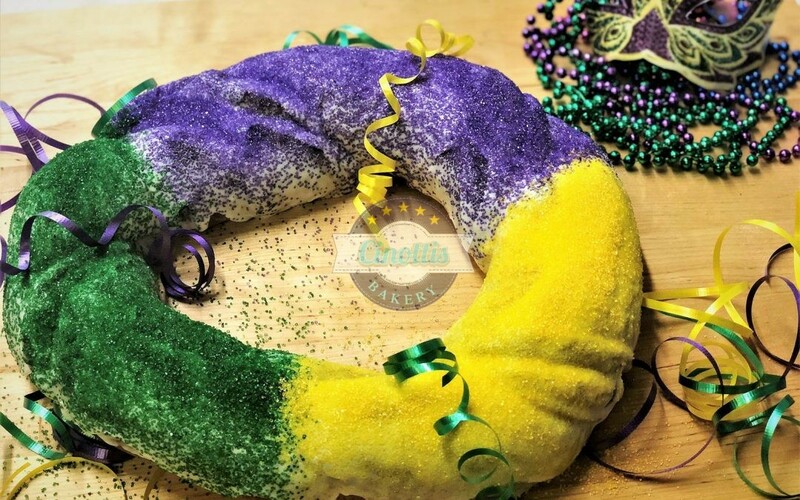 If you are serving the king cake to children or prefer to not have the plastic baby in the cake, you will need to order the king cake in advance. We will take orders for king cakes via phone or in our store up until Friday, March 2. We hope this Mardi Gras brings good fortune to you and your family. As always, we are ever thankful for your continued support of our family dream.